A show-booth owner employs a young poet to invent stories for the waxwork figures he exhibits. The poet accepts the commission so that he can be close to the owner’s beautiful daughter. Waxworks shows three of these stories, as inserted episodes. “Sultan Harun al Rachid” falls in love with the beautiful wife of a pie-maker, and comic-dramatic intrigues ensue. This is followed by the episode “Ivan the Terrible”. Czar Ivan has conceived a plan whereby his enemy is poisoned by a specially mixed brew; but he becomes obsessed by the fear that he himself will be poisoned and finally goes mad. The episode “Jack the Ripper” is particularly sinister. Real and invented characters whirl around to an eerie rhythm. But this turns out to be the poet’s dream vision - he has fallen asleep while writing - and he wakes up in the arms of his lover. Paul Leni was born in 1885 in Stuttgart and died in 1929 in Hollywood. After training as a draftsman at an ornamental ironworks, he studied at the Berlin Academy of Fine Arts, followed by work designing film posters and stage sets. He worked in film from 1913 onwards, making his debut as a director with Das Tagebuch des Dr. Hart in 1916. After the First World War, he designed the sets for Leopold Jessner’s melodrama Backstairs (1921). 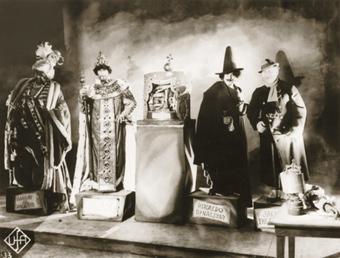 In 1924, he directed the episodic film Waxworks (Das Wachsfigurenkabinett). In the years that followed, he worked primarily as a set designer for various producers. From 1926 onwards, he arranged several stage shows in New York, and designed numerous crime thrillers for the Hollywood producer Carl Laemmle, causing a sensation with his ingenious lighting and visual effects. His other films include: Dornroeschen (1917), Die platonische Ehe (1918), Prince Cuckoo (Prinz Kuckuck, 1919), The Genoa Conspiracy (Die Verschwoerung zu Genua, 1921), Backstairs (Hintertreppe, 1921), The Cat and the Canary (1927), and The Last Warning (1928), among others.